Malinda Lo is one of a few local authors at the World Fantasy Convention in San Jose. The World Fantasy Convention coming to San Jose could have been an opportunity to meet authors from around the world; but since this is the “hyper-local” Metblogs, I used it instead to meet a few local fantasy authors. San Francisco-based Malinda Lo has just published her first novel, Ash. It’s a lesbian retelling of the Cinderella story, aimed at young adult readers. Malinda told me that having successfully published this novel, she’s been able to quit her day job and make writing her full-time job. She now has a second novel in the works, due out in spring of 2011. Malinda will be back in the South Bay next week for the Friends of the Los Gatos Public Library Friday Forum. The event is Friday, November 6, starting at 6:30 in the Town Council Chambers at 110 E. Main St. in Los Gatos. North Bay-based Ann Wilkes has published several short stories, and recently released a short novel, Awesome Lavratt, a humorous story of galactic conquest. I also met Healdsburg writer Camille Picott, who just published a story for elementary-school kids, Raggedy Chan, with illustrations by Joey Manfre. The book is published by Picott’s own recently-launced publishing venture, Pixiu Press, and comes with an associated teaching curriculum. Also from Healdsburg, the writing couple of Michael Shea (a two-time World Fantasy Award winner) and Lynn Cesar were there with a limitted edition of Michael’s anthology, Copping Squid, featuring Lovecraftian fantastic horrors. A “trade” edition is due out shortly. Michael has been writing since the 1970’s, and his stories have appeared in The Magazine of Fantasy and Science Fiction and have bene collected in various “Best of the Year” anthologies. Michael’s next novel, The Extra, set in a horrific near-future Hollywood, is due out in January. Lynn’s novel Apricot Brandy is marketed as romance, but mixes in elements of horror and fantasy, as it brings the Mayan gods to life in Northern California. The 2009 World Fantasy Convention celebrates Edgar Allen Poe's bicentennial. The 2009 World Fantasy Convention kicked off today at the Fairmont Hotel in downtown San Jose. This isn’t the kind of fantasy convention where you can dress up like a hobbit or chase your friends around with a styrofoam pole-axe. It’s more a gathering of industry insiders, like authors, artists, and publishers, getting together to talk shop. In fact, if you haven’t already bought a (pricey) membership in the convention, you won’t even get in the door. For those insiders, though, the convention holds 3 and a half days of panel discussions, presentations, and readings about the craft of making fantasy, as well as an art show and a dealer’s room. On Sunday afternoon, they’ll award the World Fantasy Awards for the best novel, best artist, and so on, in the field of fantastic literature (a list of nominees is found here). Public events associated with the convention are few, but there will be over a dozen authors will be available for signings at Borderland Books in SF on Monday, November 2, at 6:30 pm. Not only do we set clocks back an hour this weekend, we can also journey back in time to the days of the Frontier Village amusement park. Frontier Village was a Western themed amusement park at the intersection of Monterey Road and Branham Lane in San Jose that operated in the 60’s and 70’s. A Campbell resident opens their back yard up for Halloween that has an old western town modeled after buildings that were at Frontier Village. Included are authentic Antique Autos, signage and other memorabilia from the old amusement park. Dressed in western outfits, they will pass out candy to the kids. You youngins and those wanting to reminisce may want to visit the Remembering Frontier Village website. After your day of Trick-or-Treating remember to set your clocks back an hour. Yes, we are heading back to standard time. Open the San Jose Mercury News Thursday morning and go straight to the comics. Greg Evans has created a special “Luann” about “Books For Treats“. Fall is a great time to replant a garden, and, if you’re willing to plant a low-water garden, the Santa Clara Valley Water District is willing to help out with rebates for water-wise landscaping improvements. The rebates are available if you replace at least 100 square feet of high-water landscaping with approved new plants, or replace wasteful irrigations systems with high-efficiency irrigation like drip tube. 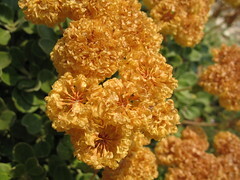 Low-water landscaping is a great opportunity to plant Californa native plants, which look beautiful, save water, and provide food and habitat for our native critters. Although its not as pretty, the landscaping rebate is also available if you landscape (or maybe replace pavement) with “permeable hardscape”, meaning porous solid surfaces that allow water to drain through into the soil. There’s quite a few restrictions on the rebate program, and you have to contact SCVWD before starting your project, so check out the details on the website for landscape replacement rebates or irrigation equipment rebates. I attended a preview of Star Trek: The Exhibition that opens Friday October 23 at the Tech Museum. I am a Star Trek fan but not a Trekker. I have seen all of the television series with Next Generation being my favorite. I have seen all of the films except the most recent. When you enter the exhibit, you are greeted with a pillared entry. Do not go racing past them, take the time to notice they have text on them, from the “where no one has gone before” dialogue to a list of episodes. Pass the pillars and you will be in a large area that includes uniforms and artifacts. There is a display featuring all of the Enterprises beginning with the Enterprise aircraft carrier, followed by the space shuttle, and then the starships. The centerpiece in this room is an immense model of the 1701-A Enterprise. We exit this area to the right and enter the bridge of the original series. This for me was a disappointment. It is a scaled down bridge with no interactive features; unless sitting in the Captain’s chair or at the helm is being interactive. The consoles have plastic non-push lit up buttons. A few of these could be setup to activate display screens, sound effects, and communications chatter. Having the forward view screen animated would liven up the bridge. Note: no photography allowed throughout the exhibit. A photo of you in the Captain’s chair is available for a fee. We exit the bridge through the turbolift and proceed down a walkway passing displays of Captain Kirk and Mr. Spock’s uniforms. Proceeding along the walkway, we enter a corridor of the 1701-D Enterprise (Next Gen), this portion of the exhibit being my favorite. First up along the corridor is Captain Jean-Luc Picard’s ready room. This closed-off area includes the Captain’s uniform, various props, and a bottle of Chateau Picard wine. Continue down the corridor to a full-scale Transporter. You can stand on the Transporter and wish photography were allowed. Look up at the monitor to see yourself; will you beam down? Next to the Transporter room is a full-scale model of the Guardian of Forever, the time portal from “The City on the Edge of Forever.” Another lost opportunity for a photo of you going through the portal. These two rooms include Captain chairs, a shooting model of the Borg ship, along with more artifacts and uniforms. Before leaving the corridor, take a close look at the displays on the walls of the corridor. Leaving the corridor, we enter “The History of The Future.” The History of The Future is a timeline, which goes chronologically from right to left. Not only is it a bit strange that the timeline is right to left, you enter the room to the left of the timeline. 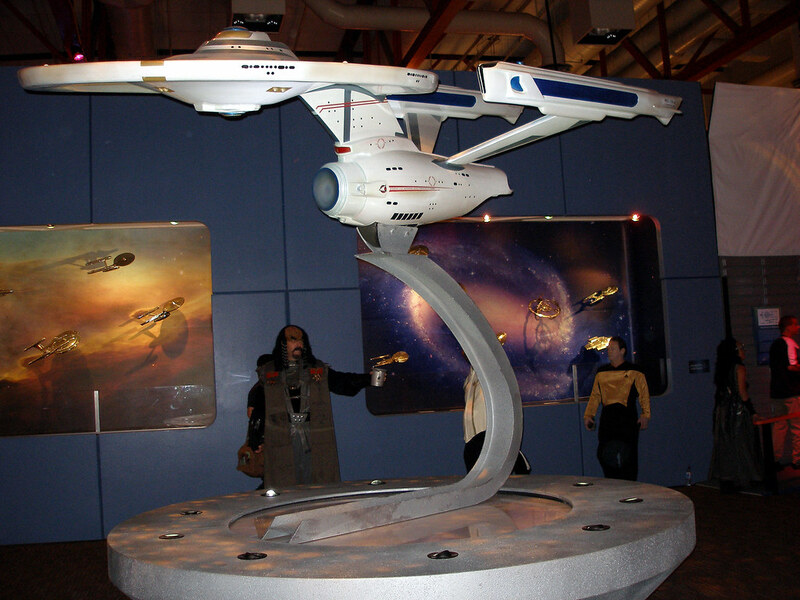 This room includes shooting models of the Enterprise and other ships. There are more uniforms on display here including those from the recent Star Trek film. The two rides have an extra fee each. There is an eight-seat ride that I found to be rather tame. There were six aboard, I was in the last row and had an obstructed view of the display screen. You are fighting the Borg as Worf (Michael Dorn) narrates. The ride rocks back and forth enough for you to slide back and forth on the bench seat. You may want to skip this one. The other simulator is a two-seater. This one is fun. You get strapped in as you will be rolling and looping. The display is right in front of you and again you are fighting the Borg. There is a warning that the ride may be too intense for some; you will be upside-down a few times. If you are going to ride both simulators, do this ride second. I recommend Star Trek: The Exhibition even though the admission is a bit pricy. Check the Tech Museum’s Star Trek: The Exhibition website for ticket pricing, hours, costume guidelines, and more. He may include his yummy Black Tea Braised Beef Short Ribs and Tea-Smoked Salmon recipes at this free event. In addition, here is an opportunity if you have never been to Ku Day Ta to relax with a calming and comforting tea drink before or after the event. microwave, the TV tuned for the World Series, and my husband would be home soon. Then without warning it all changed in seconds. The TV flickered and then almost simultaneously everything was in motion. Books fell off of the shelves, the microwave cart started to move from the kitchen to the front room, and I was running for my daughter. Fortunately my family suffered no injuries. The sorry plight of the people trapped in the Cyprus Freeway collapse made quite an impression, so I do carry bottled water in the car. But this many years later I am not prepared for the next big one. Is anyone? Tomorrow morning we can participate in “The Great California Shake Out” and learn to help keep ourselves safe. San Jose: The Tech Museum is the epicenter for Northern California. USGS, American Red Cross, San Jose police and fire officials, among others. 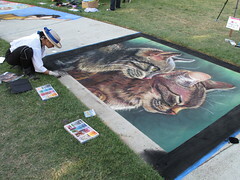 Sharyn Chan Namnath and Andrea Johnston painted this chalk mural, sponsored by the 13th Street Cats rescue group. 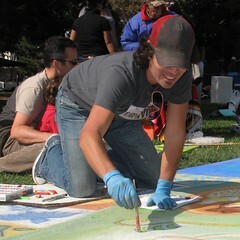 Today the Luna Park Business Association hosted the second annual Luna Park Chalk Art Festival in Backesto Park. 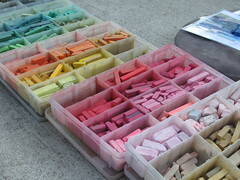 At least a couple of dozen artists got together to paint sidewalk murals with chalk and pastels. The artists ranged from chalk art festival circuit riders Wayne and Cheryl Renshaw and well-known local muralist Paul J. Gonzalez, to enthusiastic high school and elementary school artists. Meanwhile, accordionist Mike Zampiceni and dancers from Movimiento Cosmic Aztec provided entertainment, and North 13th Street restaurants served refreshments. The event drew plenty of visitors, and there was always a crowd admiring each of the artworks. The Renshaw’s work was particularly fascinating as they used computer image manipulation to create an image with proportions adjusted to look natural when foreshortened by viewing from an angle. 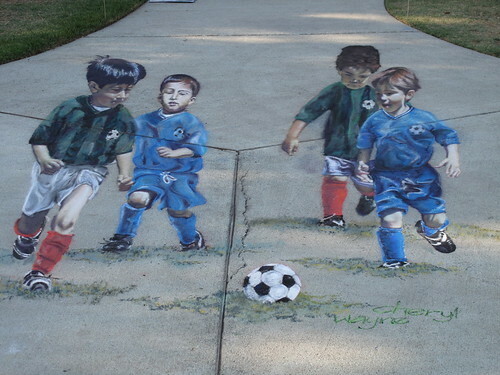 Viewed from most directions the image is distorted and surreal, but viewed from directly below their soccer playing figures become surprisingly lifelike and almost seem to stand out from the sidewalk. Second Chance Day is a donation drive hosted by the Town of Los Gatos this Saturday October 10 from 9:00 am to 3:00 pm. Your donations (clean and in good condition) will be given to Saint Luke’s Church Pantry Program, Emergency Housing Consortium Lifebuilders, InnVision, Career Closet, Next Door Solutions to Domestic Violence and the Humane Society of Silicon Valley. These are local agencies within Santa Clara County. Accepted donations in men, women and children sizes include: sweaters, sweatshirts, jackets, coats, raincoats, wind breakers, jeans, and sweatpants. The donations of towels and blankets go to help animals housed in the Humane Society of Silicon Valley in Milpitas. Donated eyeglasses will go to the Los Gatos Lions Club’s “Lions in Sight” program, which donates refurbished glasses to people in third world countries. Prescription eyeglasses and UV protected sunglasses, non-prescription UV-protected sunglasses, along with non-prescription reading glasses are accepted.